As you can see there is a horse and 2 hippos there too as I noticed one of the misprints on the back had them on.. I love hippos! You don't see enough hippos! 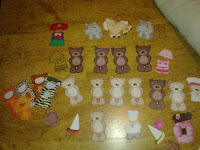 As Lil Myz seems to like colouring, animals and dressing them how about printing some of these off for her http://www.karenspaperdolls.kirkehelsinge.dk/ I remember having a doll like them when I was little. How cute are them bears - and they have clothes!!!!! oooh these are sooo cute.